A lovely heirloom dress for flower girls, portraits, First Communion, baptisms and holidays. The dress is made with batiste fabric in a COLOR OF YOUR CHOICE and is embellished with lace around the collar, sleeves and at the hem of the dress. 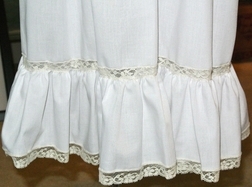 A beautiful feature of the dress is horizontal wide white or ecru satin ribbon woven through entredeux across the square collar and the a beautiful full ruffle at the hem. 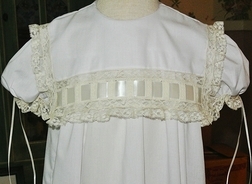 Satin ribbon also embellishes the sleeves and form pretty bows.